Here I was hoarding my Cream & Sugar Valentine's collection because I thought nothing could be cuter... until now! 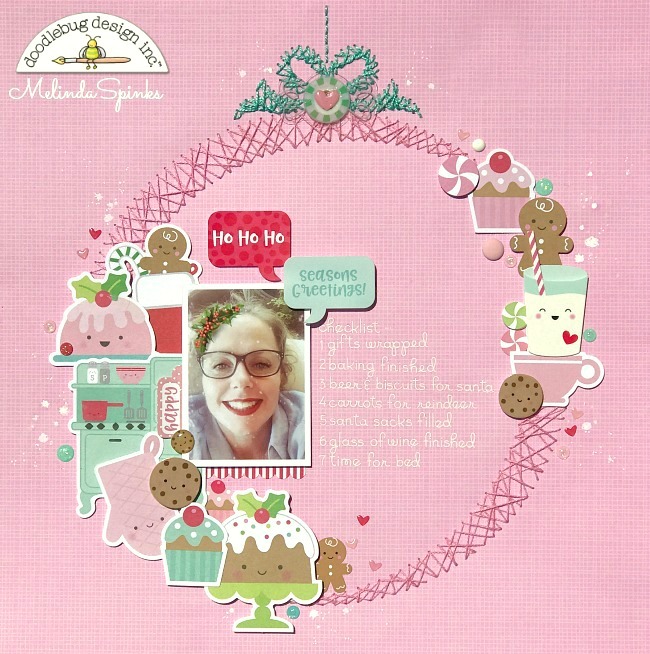 The new Milk & Cookies literally makes me smile as I craft because those darling little faces on the icons are just so 'happy'. 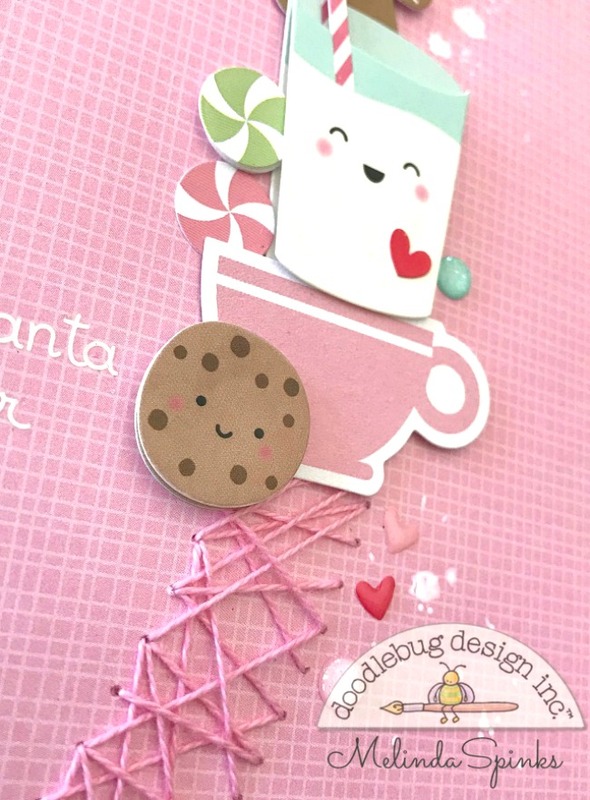 And the addition of pink and mint to the Christmas colour palette is simply perfect! After drawing a rough sketch I set about preparing the background with holes for a hand stitched bauble. My intentions were to make a paper bow however I felt it might make the layout top heavy and take away from the icon cluster I had planned. Crazy stitching is so effective and fun to do but keep in mind that it uses allot of thread and takes far more time than a regular stitch. This photo of myself was a little crazy which portrays exactly how I feel on the Eve of Christmas after the mad lead up... I usually finish the day with a glass of wine or two whilst waiting for the 'hayseeds' to go to sleep before we can sneak in and deliver the Santa sacks to the end of their beds. 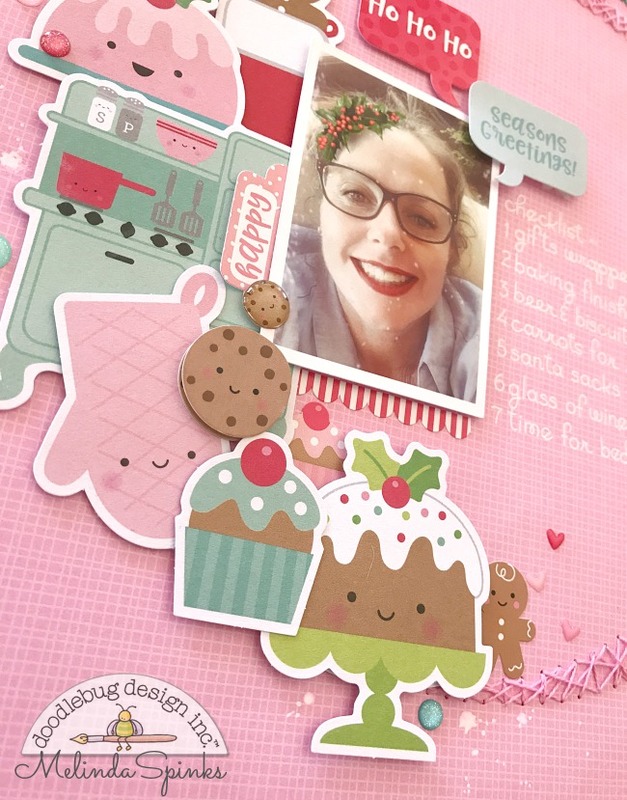 TIP: I love, love, love the speech bubbles from the 'This & That cardstock sticker sheets. However I do like to place them slightly over my photos so I always rub the backs with baby-powder first to remove the sticker adhesive before adding a dimensional pop dot to the back. Foam adhesive pop dots were also added to the icon clusters as I really wanted lots of layering around the stitching. "Aren't those wee faces just the cutes things?" 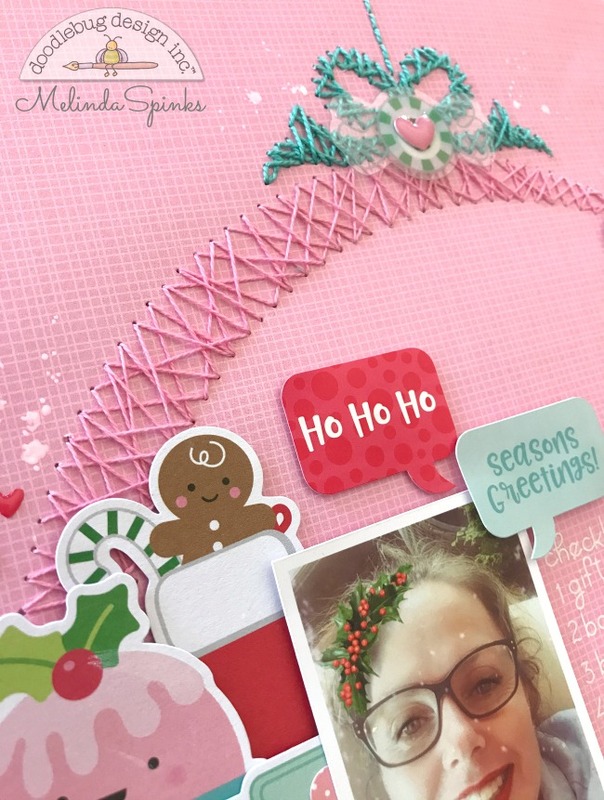 To soften the overall look I placed random scatters of Glitter Sprinkles, Matte Sprinkles and Shape Sprinkles then finished the layout with a few splats of white ink. 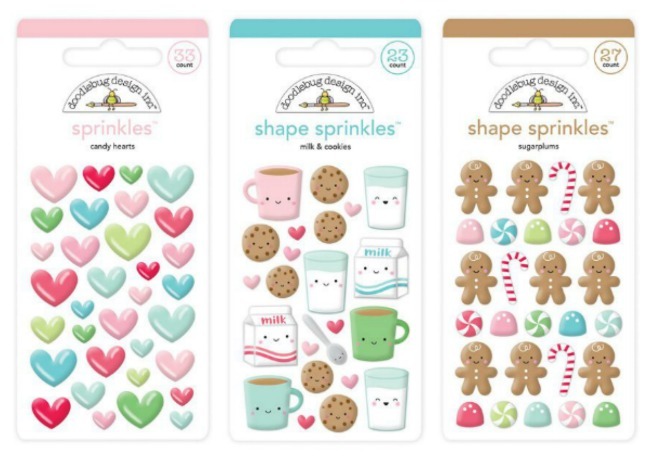 And just in case you missed them... have a look at the shaped sprinkles from this collection. Now you know why it's hard not to want to hoard them forever. 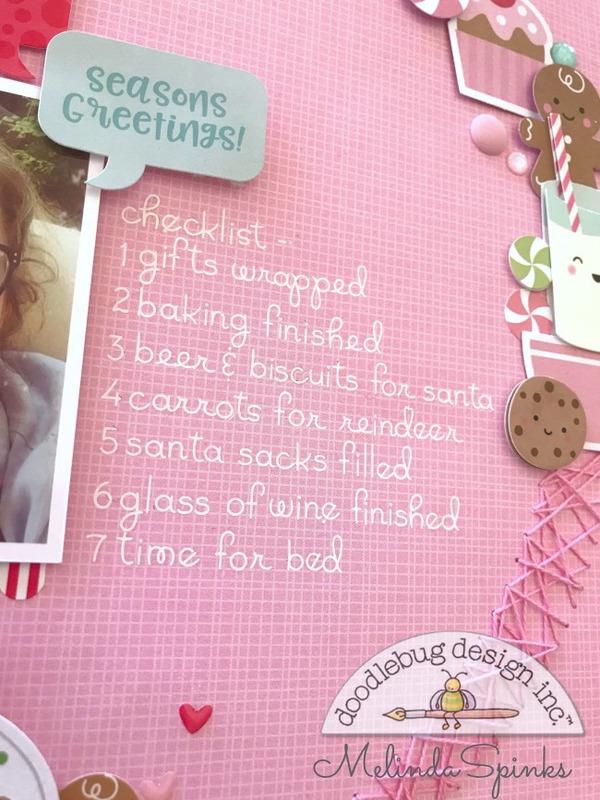 So, that's a wrap for our Christmas inspiration, hopefully we've given you lots of creative ideas to help you with your festive preparations. I LOVE the stitched wreath!!! Oh and number 6 on your list!!!! Absolutely adorable and quite yummy!